Taipei, July 12 (CNA) Taiwanese charity Tzu Chi Foundation is helping with relief efforts in western Japan's flood-hit Okayama Prefecture, providing hot food to flood victims, according to a press release issued by the foundation Thursday. Tzu Chi volunteers from a Japanese branch of the Taiwanese charity started to arrive in affected areas Monday and as of Thursday were operating in the city of Kurashiki, cooking food for about 200 people per day at an elementary school-turned shelter, the press release said. 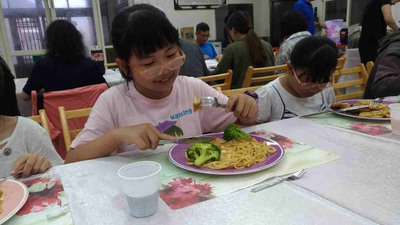 Due to the high awareness of disaster prevention in Japan and the mobilization of local charities, the shelter has sufficient food, water and clothing, the Tzu Chi Foundation pointed out. As of Thursday, the death toll due to heavy rains that caused massive flooding, especially in western Japan, had reached approximately 199, with dozens of people still missing, Japan's Chief Cabinet Secretary Yoshihide Suga said.